Penn Manor’s technology department is at it again. Named a 2011 School of Excellence in Technology, Penn Manor’s technology department has remained on the cutting edge with projects throughout the district. Penn Manor was one of three schools that won this award in the state of Pennsylvania. The district’s head of technology, Charlie Reisinger, said it wasn’t one specific project or accomplishment that put Penn Manor on top, it was everything that is going on with technology around the schools. Reisinger said it starts with the teachers wanting to use different techniques. Some even come in over the summer to learn new tools and programs, said school officials. “The staff really responds to the ongoing support,” said Reisinger the head of the district’s technology department. Penn Manor’s projects can be very unusual. From a second grade class video chatting another class in India to high school students creating podcast book reviews, the sky is the limit sometimes. 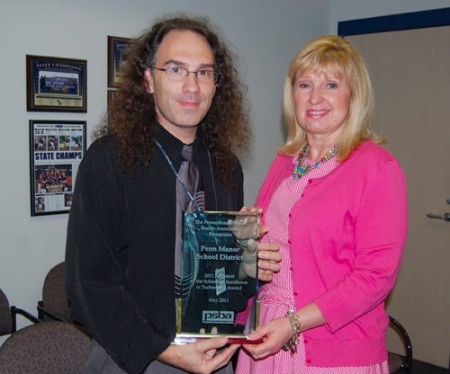 Charlie Reisinger accepting the 2011 School of Excellence in Technology award behalf the district. “We have a board that understands technology, its strategic value, not only operationally but from the instructional side,” said Reisinger in a recent interview for a Pennsylvania School Boards Association publication. Penn Manor’s online newspaper has won multiple state and national awards. Going to an online paper definitively paid off for the district. “Our print newspaper would be read by maybe a couple hundred people. By the time it was printed, the news would be stale. When the decision to move 100 percent online came up, we knew there were risks involved- students would be publishing directly on the Internet,” said Reisinger. It was a huge success that caught the eye of many through the county, state, and nationally. “There were many reservations towards making the switch, but it has been a resounding success,” added Reisinger. Penn Points has recently recorded their 375,000th view which is a major milestone. “We will be at 400,000 before its third year is up,” predicted Susan Baldrige the journalism teacher who advises the student paper. Penn Manor is truly breaking through with all of the innovative technology projects that are being done. “Blogs were a big deal and so was Penn Points, ” said Reisinger. Although it wasn’t just technology projects that caught their eye. Open source are programs that replace programs that are more expensive but actually work the same or better then the programs that the school district would have to pay for. No wonder Penn Manor was named a 2011 School of Excellence in Technology.